If you’re trying to lose weight you don’t have to give up on your coffee. 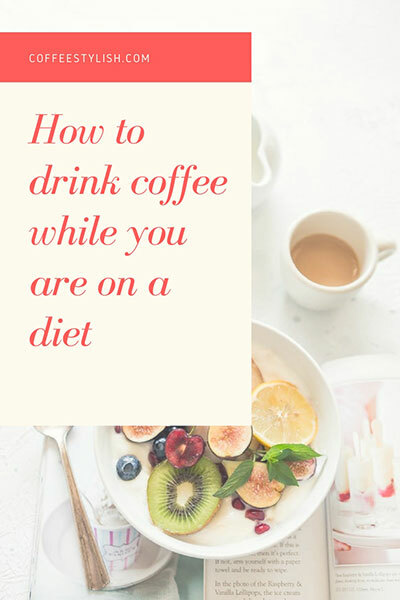 Read the stuff below and learn how to drink coffee while you are on a diet. In my option, you should always avoid “diet” coffees. These products are usually full of chemicals and are not always safe for our health. Regular coffee has all the benefits you can get from caffeine and there is no need to buy “diet” products. Studies confirmed that black coffee stimulates calorie burn and helps control appetite. Just make sure you don’t overdo it – drinking too much coffee can have negative health effects. Caffeine is also effective for cellulite, but only as a mask or scrub. Drinking high amounts of coffee can actually make cellulite worse. I know that chocolate mocha and iced caramel lattes are super delicious, but they can have more than 500 calories per serving! You should avoid these calorie bombs as much as possible. Black coffee, Americano or maybe a standard latte are your best options for weight loss. Unless your weight loss plan forbids dairy products, you may use milk. Good choice: dairy free milk options (almond, coconut milk) or skim milk. Avoid half and half, sweetened condensed milk and whipped cream. If using store-bought creamers, always read labels. A fat-free creamer normally has more sugar than a regular creamer. Read labels and choose wisely. Although artificial sweeteners are a good choice if you want to get a sweet taste with no real sugar in it, some studies have confirmed that it’s better to use regular sugar. It is believed that body can differ real sugar (carbohydrates) and a fake one. Since our body needs sugar, it suffers and feels hungry all the time so you will actually lose fewer pounds if you use artificial sweetener. After all, sweeteners are not made for weight control but for people with diabetes. So, if you want to fulfill your diet’s and your body’s requirements, it is best to halve the amount of sugar you normally use. You will have sweet coffee but you are still on the right track with your diet. If you don’t want to use sugar, Stevia is a better choice than artificial sweeteners. Calories add up easily. If it’s possible, avoid chocolate or caramel syrups and sauces while on a diet. Black coffee and espresso are calorie free. Use small amounts of sugar or choose Stevia. Regular milk, almond, and coconut milk are a good choice. Avoid sugary creamers, sauces, huge amounts of whipped cream and sweetened condensed milk. Disclosure: I am not a registered dietitian, nutritional therapist, or medical professional. All information provided in this blog post is for informational and educational purposes only and is not to be taken as medical advice or instruction. No action should be taken solely on the content of this website. Please consult your physician or a qualified health professional on any matters regarding your health and wellbeing or on any opinions expressed within this website. Hi Tamia, coffee has 0 calories so it won’t add up calories. The small amount of sugar will probably add a few calories.